The revolutionary changes that happened in the field of Information Technology and lightning speed of internet have made things much easier. Unlike the previous years, computer and internet are widely used for online transfer and other purposes. Taking an edge of the innovative service, the Kerala State Electricity Board too has come forward providing online support to the consumers. Consumers can now pay the electricity bill online through Kerala State Electricity Board's official website. The services rendered by the website include online bill payment, bill view and print, complaint registration and tracking. Much interestingly, users can search to locate contact persons and offices in the hierarchy with addresses, phone numbers and e-mail IDs. The Kerala State Electricity Board now provides the most convenient way of payment where both credit or debit cards can be used for transaction. To use the facility, one has to fill in the customer number, select an electrical section and enter a debit or credit card to be used for payment. As there is no registration or login required to make the payment, the procedure is fast and comfortable. Other than Visa and Mastercad, the payment can be made through Net banking. For those who are new to the system, the following information would help you while using the facility. While attempting to make the payment, keep the latest Electricity Bill on the table. You will be asked to select the section. Do enter the consumer number and bill number. Enter the Email id and/or Mobile Number. Click show bill details which take you to a desired page. You will be asked to select the desired mode of transaction; Net Banking, Credit Card or Debit Card. Later the balance amount along with Surcharge applicable (if any) and applicable transaction charges will be shown. Finally, a confirmation screen with net transaction amount will be shown. User can take printout of the receipt. While during the online payment, if the amount is deducted from bank account, it may take 48 hours to generate the transaction details. The KSEB support team will be available to provide convenient help for the online users. 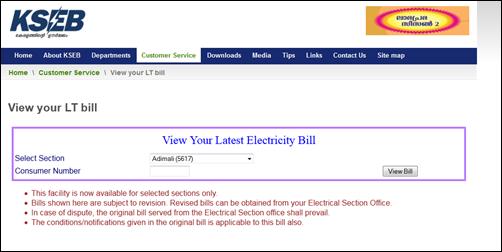 Kerala electricity bill online payment can be done at the official website of Kerala State Electricity Board. Developed on a free-and-open-source-software (FOSS) platform by the information technology wing of KSEB in Kozhikode, the website is a complete solution for paying bill while avoiding standing in queues.